Quarterback Cooper Hancock of the Darien Blue Wave passes during the 11th Annual Grip It and Rip It competition on Saturday July 7, 2018 at New Canaan High School in New Canaan, Connecticut. NEW CANAAN — The battle rages on. 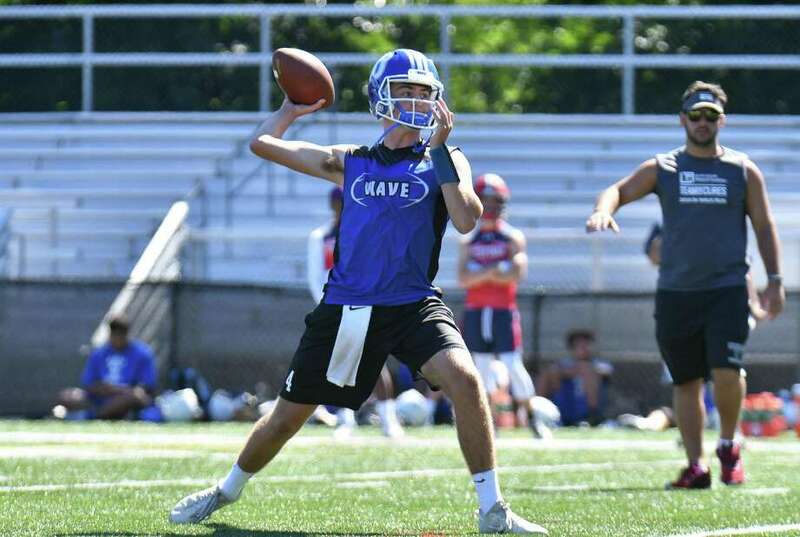 There’s little that can be solved in Darien’s quarterback competition between rising-junior Peter Graham and rising-senior Cooper Hancock until pads come on in live scrimmages, but this weekend’s Grip It and Rip It 7-on-7 competition at New Canaan High School served as another step in the development of both quarterbacks. Everyone around the program has said the competition has been healthy for both hopeful-starters, each of which is using the sessions to develop a rapport with the receiving corps at Darien. Tyler Herget figures to be the head of that receiving group, and doesn’t think the cycling of quarterbacks is having a negative affect on his position. Defensively, Darien is much less worried about who is lining up at quarterback, and more so about acclimating new faces and learning the terminology. Connor Fay will begin his third year at middle linebacker in 2018, and while his M.O. is physicality, he still finds the non-contact leagues useful for the fall. Darien will have a largely new cast in the secondary and linebacker levels, but Fay—who has been a part of two state champion teams in his career — likes what he sees out of this year’s group. Darien eventually fell 30-15 in the quarterfinals against host school and rival New Canaan, but the message that the Blue Wave want to send is that while the FCIAC may be as strong as it’s been in recent memory, don’t forget about Darien.